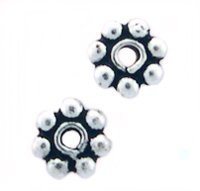 Sterling Silver Bali-Style Daisy Spacer Bead measures approximately 1mm x 4mm. This is nearly the same as the actual Bali bead, but with 7 points on the daisy instead of 8. Still perfect for inbetween those 4mm Swarovski's!! This item is sold in packs of 50!